"Christmas Gift Tags 2018 Too" give you an additional set of completely different downloadable, printable Christmas gift tags to add to your Christmas gift wrapping. 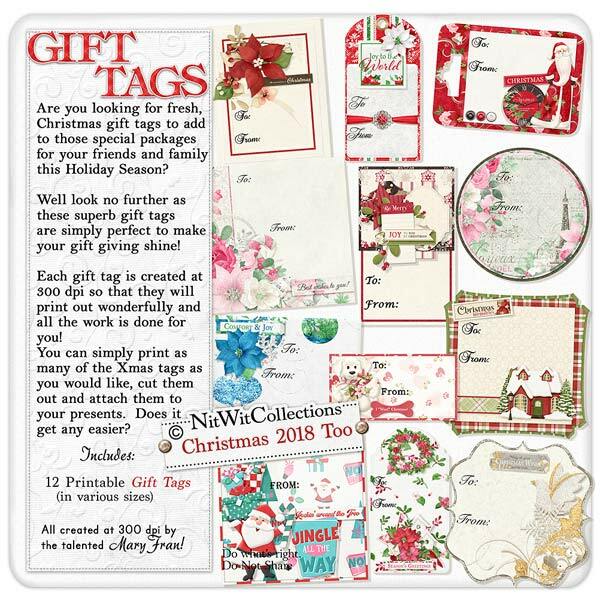 We know you'll be wrapping so many different gifts and the colours and genres of these Christmas gift tags give you so many useful options. Simply print them off on cardstock or adhesive paper, cut them out and fill in the "To:" and "From:". Unique Christmas gift tags will complete the entire gift giving experience. 12 Downloadable printable Christmas Gift Tags created using various Christmas themed digital kits from Nitwit Collections™. These tags are created large in size...so you can shrink them for smaller gifts, but still have original large gift tags for those oversized gifts.